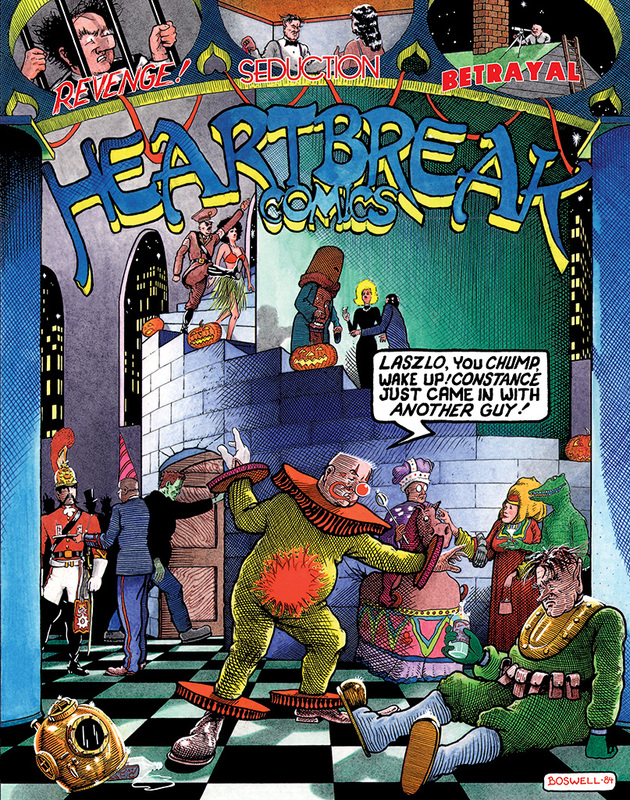 The only comic that actively promotes a pure Neanderthal weltanschauung! See how Reid deals with grouchy managers, angry customers, hot-rodding hoodlums, and mad dogs—without once missing his favourite TV show! This comic is FREE with every purchase of ROGUE TO RICHES [see below]. 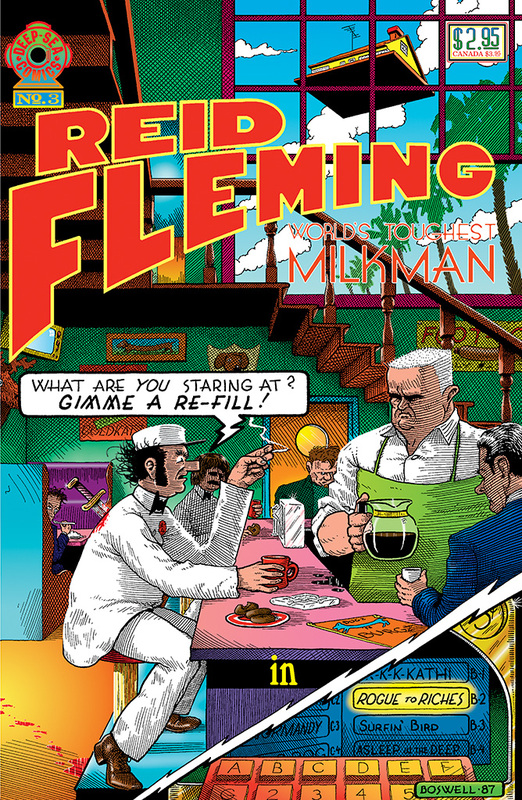 ROGUE TO RICHES collects issues 2—6 of Reid Fleming comics into a handy "graphic novel" that is crammed with laffs, thrills, and grotesque bizarrerie! BONUS! 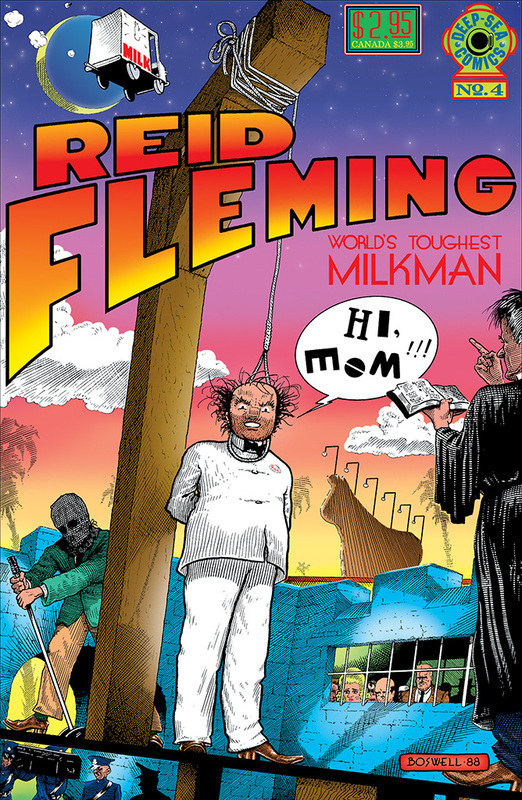 Receive a FREE copy of Reid Fleming #1 when you buy this book! Chapter ONE of the five-part ROGUE TO RICHES, written and drawn by David Boswell. 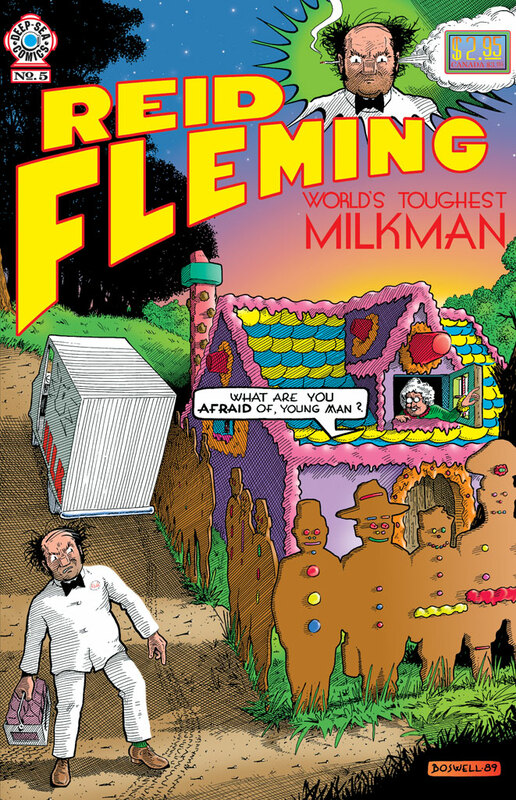 In this issue, which continues on directly from Reid Fleming No. 1, laffs and thrills abound as Reid and his truck crash a suburban back-yard barbecue—from 600 feet! See Reid watch his favourite t.v. show—on someone else's TV! See Reid double-talk his boss! Play with dogs! Smash into trains! And don't even think about missing Reid in love! Chapter TWO of the five-part ROGUE TO RICHES. Did Reid survive the collision with the locomotive? 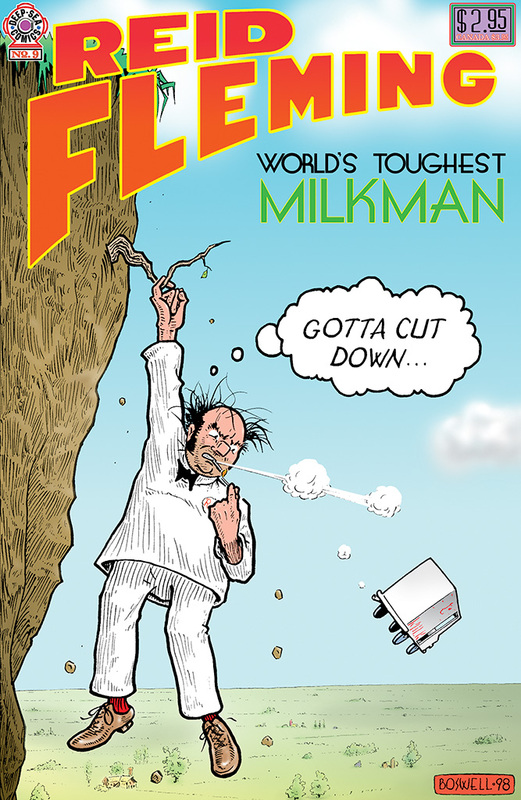 How can he deliver milk with that huge knife in his back? Why is that customer firing a rifle at Reid? 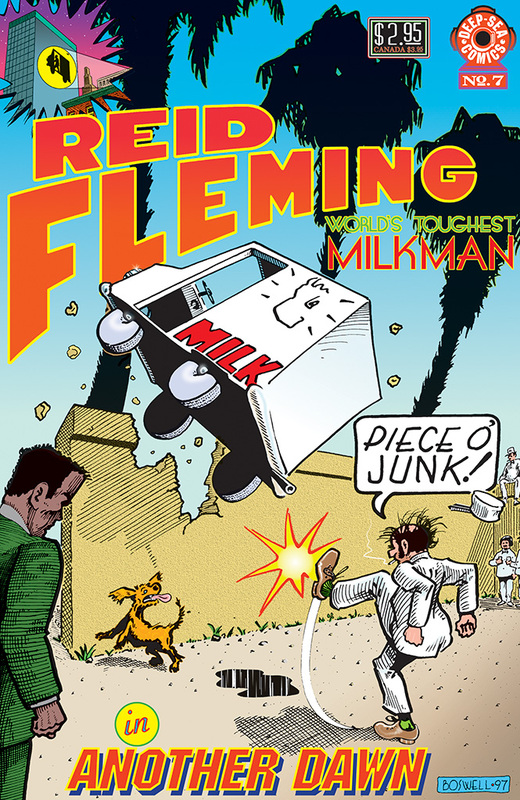 Has Reid really wrecked ten milk trucks? Or only nine? Will Reid's love-affair with television personality Lena Toast continue if Reid is fired? There's only one way to answer these questions! 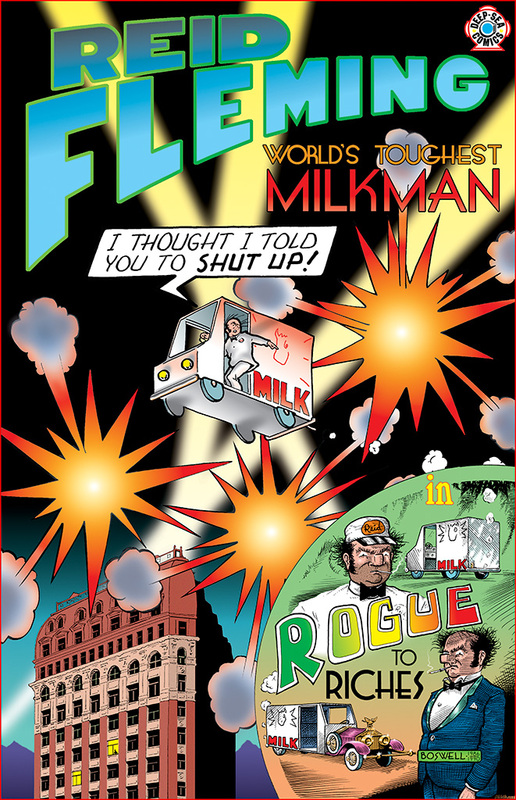 In the third installment of ROGUE TO RICHES, our hero, the World's Toughest Milkman, is now no longer a milkman—except in his increasingly bizarre dreams. Reduced in status to a mere "cable TV installer", Reid nonetheless displays tremendous dash and bravado in his encounters with irate customers, lawn elves, and pretty maidens in bathtubs. See how Reid solves the eternal dilemma: Work or Fun? And prepare to be astounded by Reid's unexpected creativity with a pocket camera! Chapter FOUR of the five-part ROGUE TO RICHES. 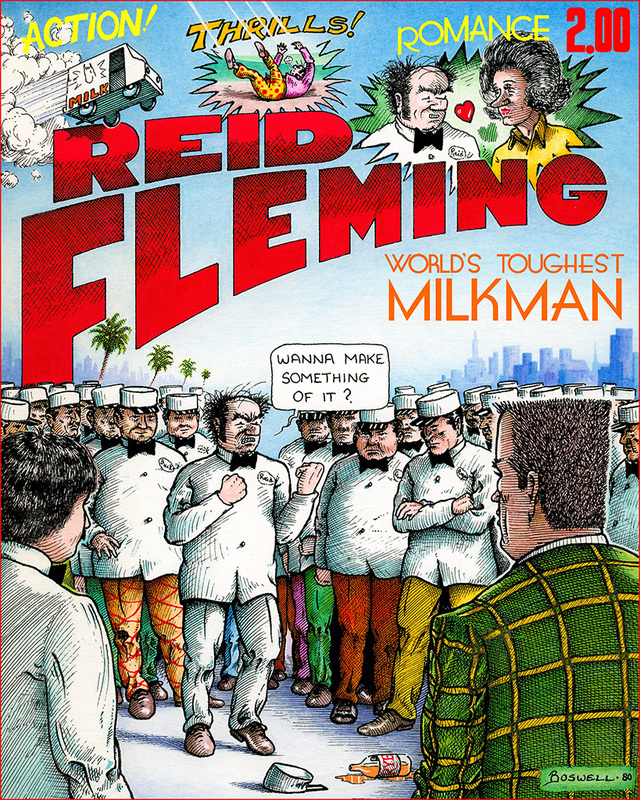 Reid Fleming worms his way back into Milk, Incorporated, narrowly avoiding disaster from speeding locomotives, giant meteorites, pursuit by the police, and angry drunken bums. 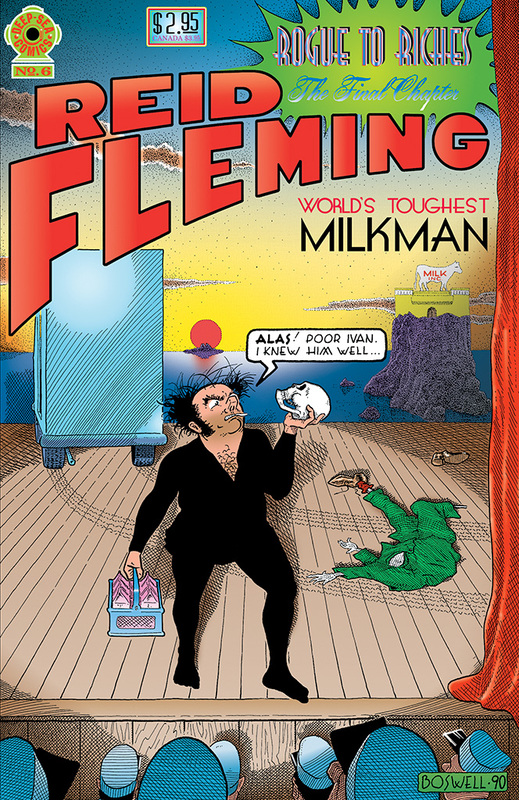 Highlights include a delivery to Reid's Mom, and a demonstration of "proper" milk delivery technique. 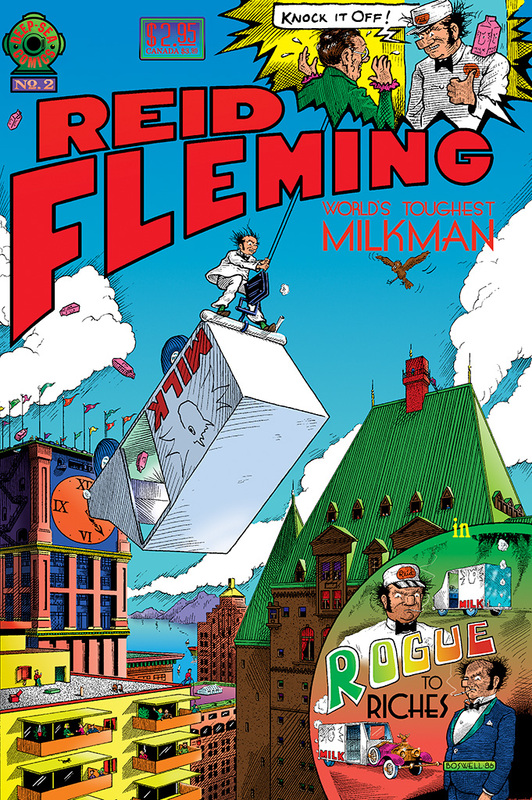 In the fifth and concluding chapter of ROGUE TO RICHES, Reid Fleming's second chance at Milk, Inc. is threatened when Mr. Crabbe marries the boss' daughter! With $170 worth of firecrackers, Reid seeks to mete out his own brand of justice to the perfidious Crabbe—but a long-buried secret surfaces to bring about an even more startling denouement. And we learn that success carries—what else?—a great cost. In Chapter ONE of the five-part ANOTHER DAWN, written and drawn by David Boswell, Reid takes a little too long to "deliver milk" to a certain customer! Seeking to atone by performing community service, Reid only makes things worse—much worse!—and is suspended for the rest of the day! Does he waste his time uselessly, watching the clouds, and running barefoot through the meadow? Or—does he make an astounding discovery that promises to alter the lives of every single human being on the planet? Chapter TWO of the five-part ANOTHER DAWN. Reid's day begins with the mother of all shaving cuts, and goes steadily downhill from there. Worst of all, his favourite TV show is pre-empted—by The Three Tenors! Chapter THREE of the five-part ANOTHER DAWN. See why discerning readers are saying that this is the funniest Reid yet! 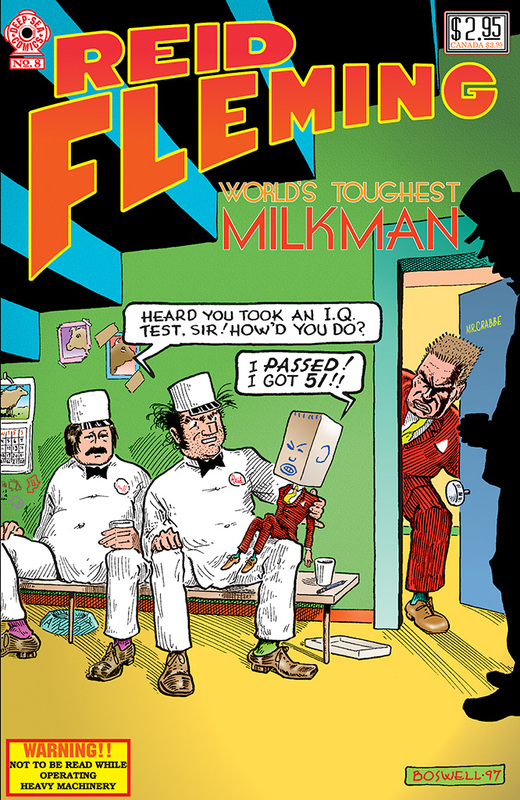 SEE the secret crypt for deserving milkmen! 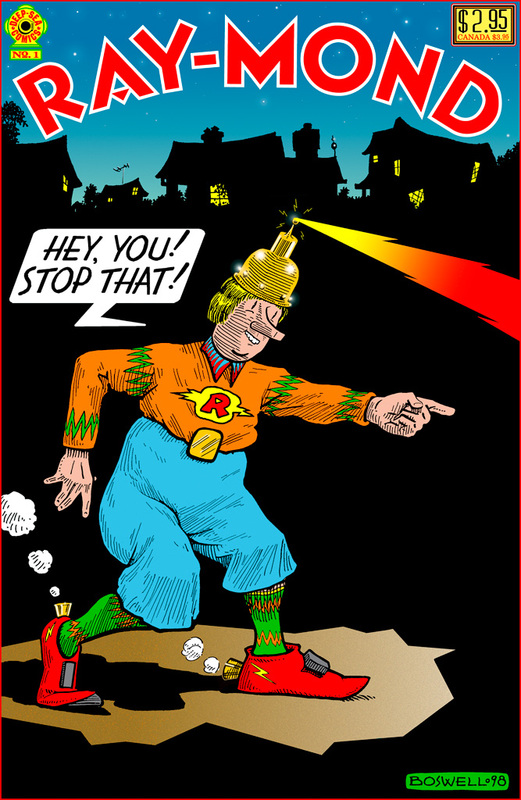 SEE Reid's daring rescue of Captain Coffee! SEE Reid with the worst hangover of All Time! BONUS!! "How I Do It", with illustrations, by David Boswell; a statement of the author's personal philosophy; more. Chapter FOUR of the five-part ANOTHER DAWN. IN PREPARATION. 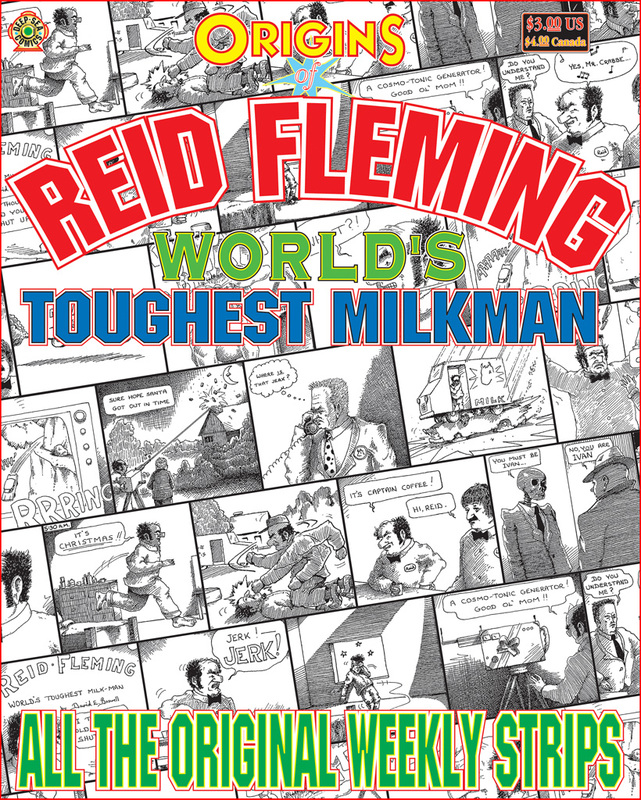 This collection of the original weekly Reid Fleming, World's Toughest Milkman comic strips, first printed in Vancouver's Georgia Straight in 1978 and 1979, will fill you with wonderment, joy, and, perhaps, perplexity. Includes fascinating text and photos! Half-vigilante—half village-idiot—Ray-Mond is a naive young man who inherits a suitcase full of "super-powers"—and all the responsibilities that go with them. But his efforts to "do good" are continually subverted by his own vanity, idiocy, and greed! TM and © 2016 by David Boswell. All rights reserved. Updated 11 September 2016.